– High-End: These are packages priced at the High-End and that typically are sold by dealers. – Tiered: These are packages that can be had in a range of configurations from fairly inexpensive up to packages that compete with the High-End. – Low-End: These are inexpensive packages most commonly used by hobbyists. We’ll take a look at the results in each category along with some commentary about what the market trends have been since the last survey in 2012. 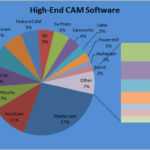 The High-End CAM Software markets remains crowded, fragmented, and somewhat confusing. 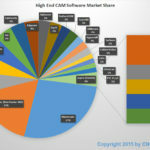 There are a lot of packages in this market, and despite the emergence of some predictions about shakouts and consolidations in the form of Autodesk buying HSMWorks and Delcam, it’s hard to see much consolidation from these survey results. 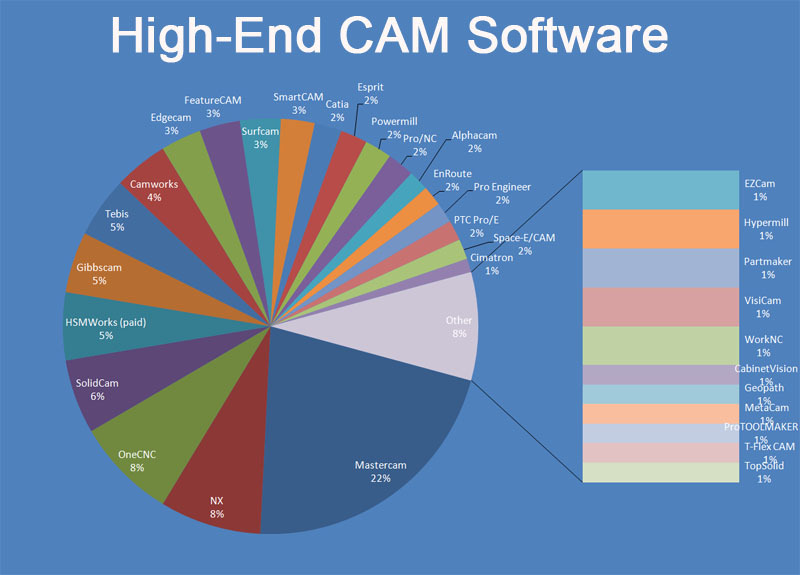 CAM software is an expensive investment, difficult to learn to get the most out of, and absolutely critical for most manufacturers. They will think long and hard about switching. – This was our most popular category, and we received 190 responses on the high-end packages. – Mastercam remains the biggest, but like the shift from 2010-2012, they lost more share. They were at 29% in 2010, 27% in 2012, and have fallen to 22% in 2014. – Big surprises in the tier right below Mastercam. In 2012, it was occupied by Solidcam, HSMWorks, and OneCNC. 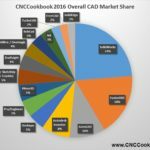 This year, we see Siemens NX and OneCNC tied to be the #2 players while SolidCam has really fallen back from an 11% share to 6%. HSMWorks is down from 7% to 5% but this likely reflects the fact that this year I broke out Paid versus free HSMWorks, and this is giving us a truer picture of their real High-End share. – The next tier also shows quite a bit of shuffling. 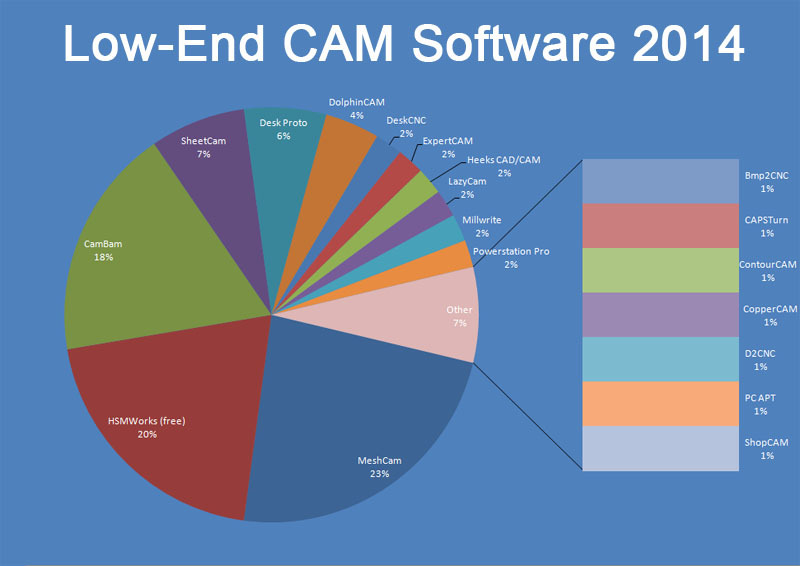 In 2012 we had EdgeCam (7%), GibbsCam (6%), and FeatureCAM (5%). This year HSMWorks has dropped into the top of this tier (replaced by NX), Gibbs stayed about where it was, and Tebis is suddenly here. I’ll be interested to watch how this story unfolds on our next survey. These two tiers are where most of the action that matters for big market shifts happens. Below that last tier the market becomes extremely fragmented. Most of the players are hanging in there, although it looks like shares are becoming even more diluted and spread thinly. Companies that had decent shares of 5% to 7% like Edgecam and FeatureCAM are now down to 3%. Surfcam has fallen off too. Lower down in the pack, many shares are relatively unchanged. This category consists of companies that have modules that let you build a CAM package at virtually any price point, depending on how much functionality you need. As such, they straddle multiple markets from low-end to high-end. – This was the second most popular category with 160 responses. 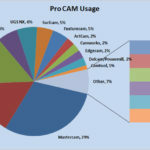 – Sprutcam has made big strides since 2012 and has moved from 2nd to 1st place with 38% market share. I suspect Tormach becoming their North American distributor has had a lot to do with that. 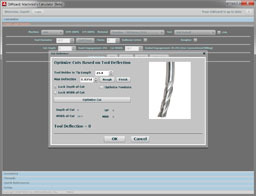 – The Mecsoft Visual Mill family comprises a number of excellent CAM products. They have a lot of share, but it seems Sprut heavily stole share from Mecsoft and BobCad. – Despite announcing a lot of new product innovations, BobCad share has fallen from 25% to 18%. – Vectric has had a good year, and has moved from 7% up to 17%. These are the packages the hobbyists thrive on as they cost less than $1000 and offer great value. This market is more crowded than ever, but the market shares are interesting. – The low-end category received 94 responses. 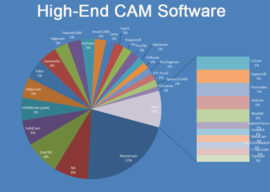 – Meshcam now holds the top spot with 23% share. It may not be the last CAM package you’ll ever need, but it is absolutely the simplest package to learn for beginners and CNCCookbook has been happy to offer it to customers who want the simplicity. – Cambam is a package a lot of people write to me about. I wanted to cover it next, even though HSMWorks beats it out for 2nd place, simply because people seem to love it. Plus, it isn’t free. Competing with free isn’t the easiest thing to do, so kudos to those doing so in this market. – Sheetcam is another package I’ve heard good things about. It seems to be falling in share a bit relative to these others, having gone from 9% to 7%, but it’s still giving a solid showing. – Dolphin and Desk Proto have each managed to increase their share a bit, so kudos to them as well. There are a ton of other packages in this category, including some that are specialized or that are more Conversational CNC packages than CAM packages. CopperCAM is for printed circuit board makers, Bmp2CNC converts bitmaps to g-code, and Millwrite is engraving software. 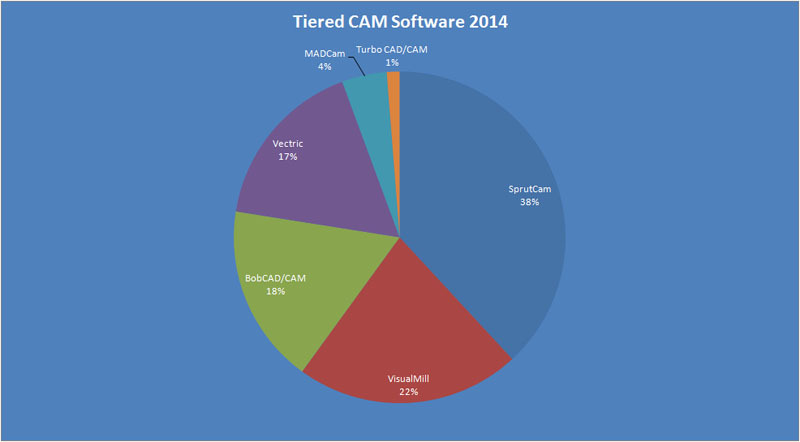 Does your CAM software run inside your CAD software or are they the same package? We will continue to alternate CAD and CAM surveys each year. Last year we did CAD so this year it was CAM’s turn. Next year we’ll do a CAD software survey. Why should you even care about such surveys? First, everyone is always curious about market share and it’s very hard to get good data about this market. Obviously these kind of numbers are important to the players selling the software and I have had Product Managers from several of the leading players tell us CNCCookbook’s surveys are their most trusted source of information they have. All that said, I wouldn’t bet too heavily on minor differences year to year. As I have said above, CAM is a crowded and fragmented market. It changes rapidly. Companies that lost share may regain it by our next survey or be replaced by some new player. The market is starting to experience some mergers and acquisitions, which can also jolt market share one way or the other. 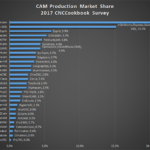 The real reason to care about market share is when you select a CAM package, it’s a major commitment. Hopefully you’ll be with it for a long time. That being the case, you want to go with a package that’s getting enough business to be around, to be able to afford to continually upgrade their software, and to be able to give good tech support. More popular players can tend to have larger ecosystems which is also helpful. With more people using a package it’s easier to find someone who can help you with a question. This is the Internet age and being able to Google for answers saves us all a lot of time. Being able to find a nice YouTube video that shows exactly how to do something we’re scratching our heads about can be a real help. I think the survey is great…I was waiting for the compilation to help with my search for a new CAM package. 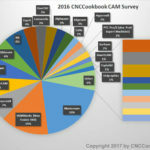 IMO, integrated CAD and CAM is a must (currently my package is NOT), and as such, is it possible, Bob, that you could make a “Yes/No” list of all the CAM packages (based on your results….you must have this info) that provide this integrated solution? This would pare-down my list quickly…and I suspect others would also be interested! Thanks. It includes everyone who visits CNCCookbook that wanted to participate. That’s a broad cross section as we get 2 million CNC machinists a year. Very interesting report. Interesting is also to analyse the size depending of the country and the market segment. In Spain for example tebis is the biggest company as CAM vendor and in the stamping die industry by far number one. 95% of all stamping dies manufacturers are tebis users.